The two singles from Mani Ratnam's multistarrer directorial, Chekka Chivantha Vaanam was released recently and the songs have been well received by music lovers. The third single, 'Sevandhu Pochu Nenju' was released earlier this morning on the digital platforms. The lyric video of the song has now been released officially on the YouTube channel of Sony Music, who have acquired the audio rights of the movie. The song is crooned by Sunitha Sarathy, Arjun Chandy and Sathyaprakash, with A.R.Rahman composing the song in Vairamuthu's lyrics. 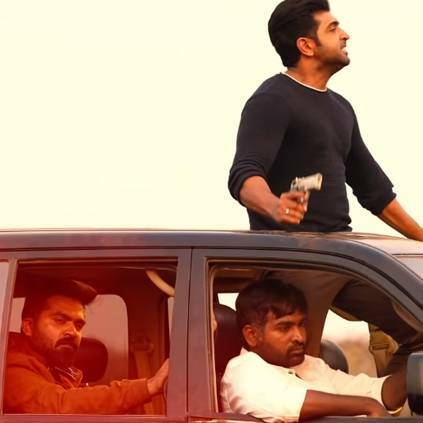 This promo video has new stills from the movie featuring its lead actors such as Arvind Swami, STR, Vijay Sethupathi, Arun Vijay, and Prakash Raj. It looks like this song will play an integral part in the movie, and not being a song focussing on just one couple. Catch the lyric video below and get the glimpse of the new stills. What Simbu Does LATE NIGHTS? - Dance Master Robert Reveals All! People looking for online information on AR Rahman, Chekka Chivantha Vaanam, Mani Ratnam will find this news story useful.